Wow, where does time go? 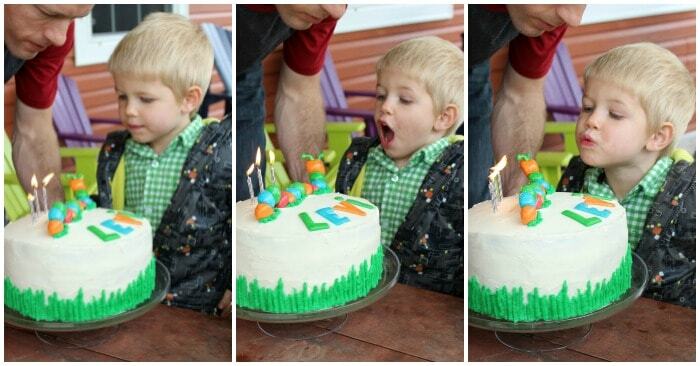 My little guy turned 3, I feel like it was yesterday that we brought him home from the hospital. I wish we had similar weather to when he was born. It was a beautiful hot summer day, instead we got a cold 10 degree day, and had to stay inside for most of it (cue sad face). 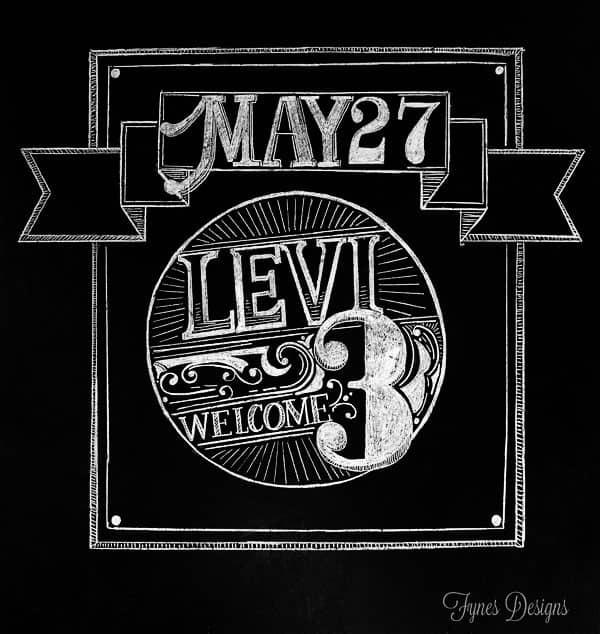 Usually for a party I would go overboard, but my little Levi is so relaxed, he didn’t ask for much, so we tried to keep it as simple as possible. His only requests were pancakes, hot dogs, candy canes, and he wanted his friends to play in the sandbox, easy enough! When I realized the weather was going to be crummy I had to think of some indoors activities in a hurry. I decided to paint a sheet of meranti board with flat black paint for the kids to use as a chalkboard… but then I hijacked it! My initial thought was it would be a cool photo background, but when I was finished with the hand-lettering it made the perfect food table backdrop! 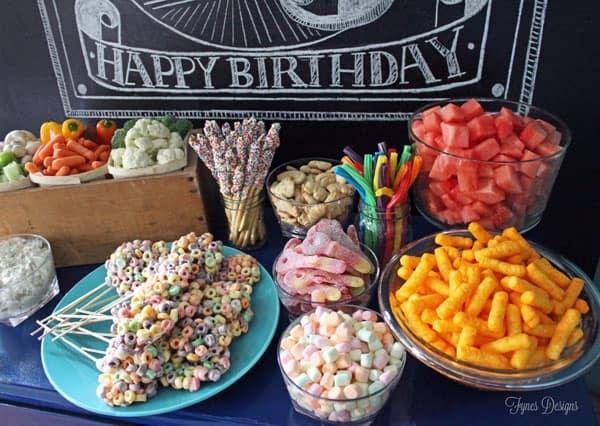 The snacks were simple too, veggies and dip, watermelon, cheesies, Froot Loop pops, liquorice, and sprinkle sticks. Levi LOVES sprinkles so together we made the sprinkle sticks, its such a great “cooking” activity for kids to help with. Just melt chocolate chips in the microwave, dip sticks in the chocolate, roll in sprinkles, and refrigerate until hard. As far as activities went the kids just played, they were having too much fun running around I didn’t need to worry about birthday party games. 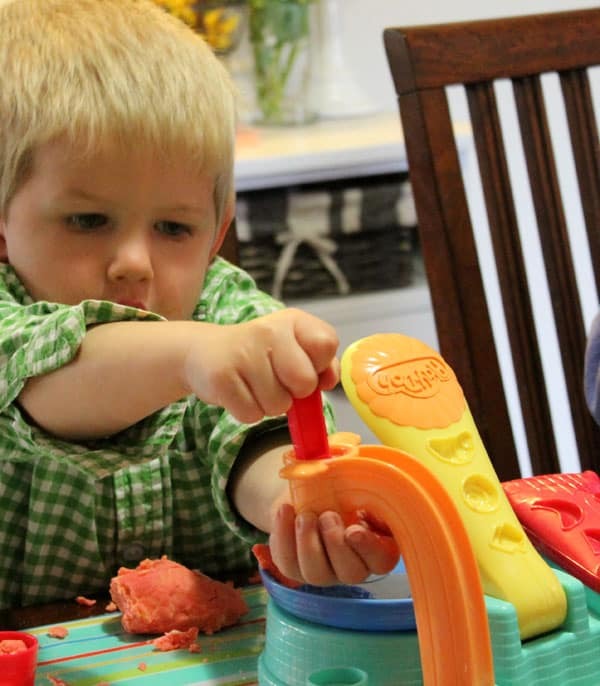 I did however (and my mom too) made some Jell-o Playdoh and the kiddos had fun making a mess with that! 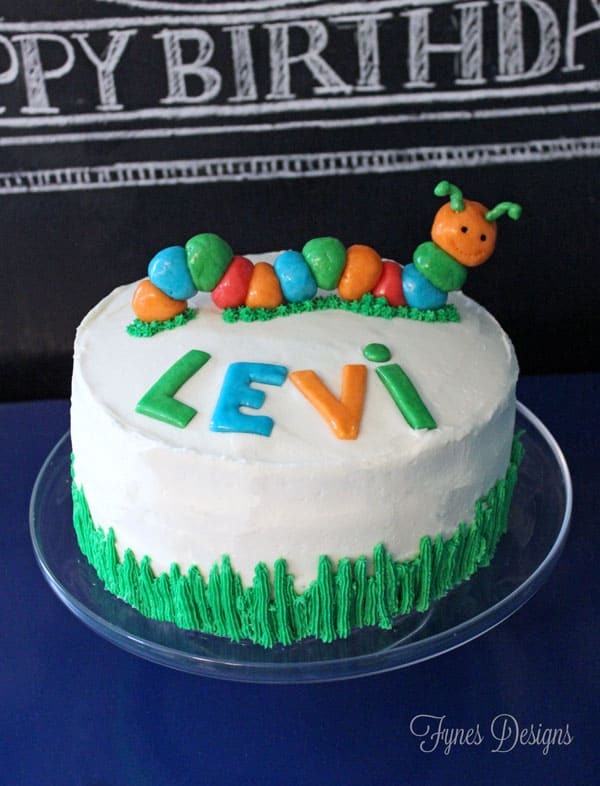 Levi had a hard time deciding what he’d like for a cake, he thought a moose, and truck, a tractor, a sandbox, a turtle, but the last suggestion was a caterpillar, so we went with it (honestly is was too easy to not take him up on the idea). I made the cute little caterpillar with Laffy Taffy. I moulded the taffy into balls and held them together with toothpicks. For the letters I rolled it with a rolling pin and cut them out with scissors. It was probably the easiest cake I’ve ever made! The cake was jello flavoured, Lime, Berry, and Strawberry. 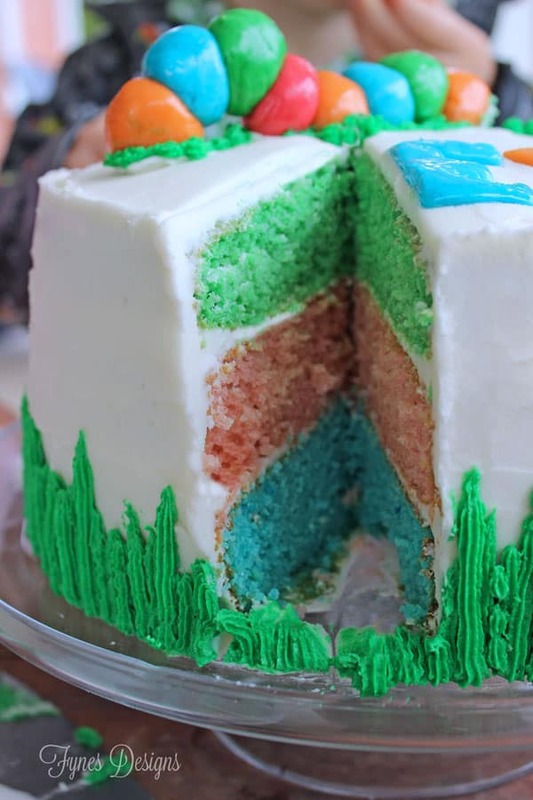 You can get the Rainbow Layer Cake recipe from Kraft. 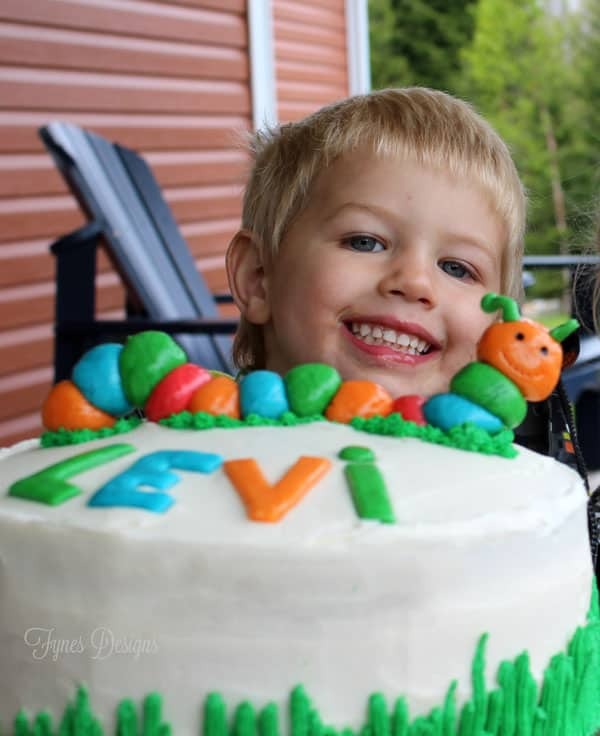 Levi loved his cake… well mainly the icing. Regardless of the chilly weather the kiddos still made it outside to play in the sand, and blow bubbles for a few minutes. It was a super fun day! Big thanks to all our family and friends who celebrated with us! Thanks Sabrina! 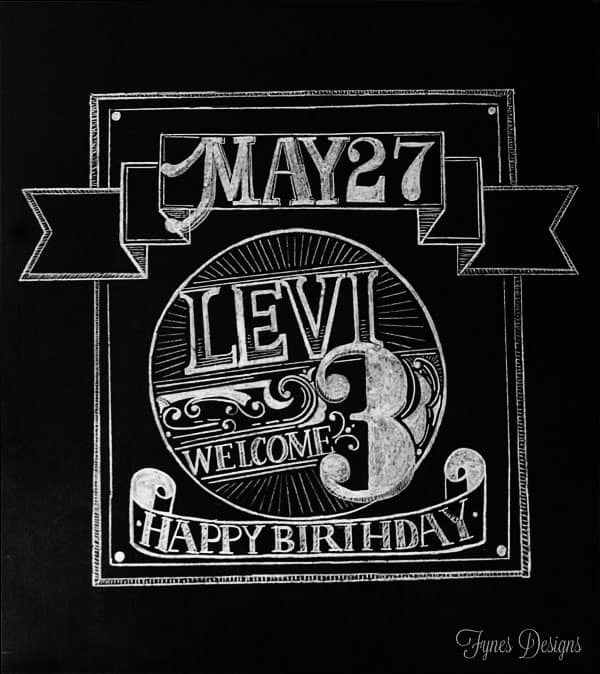 Making the chalkboard was a lot of fun! Looked great Virginia! LOVE the sign. 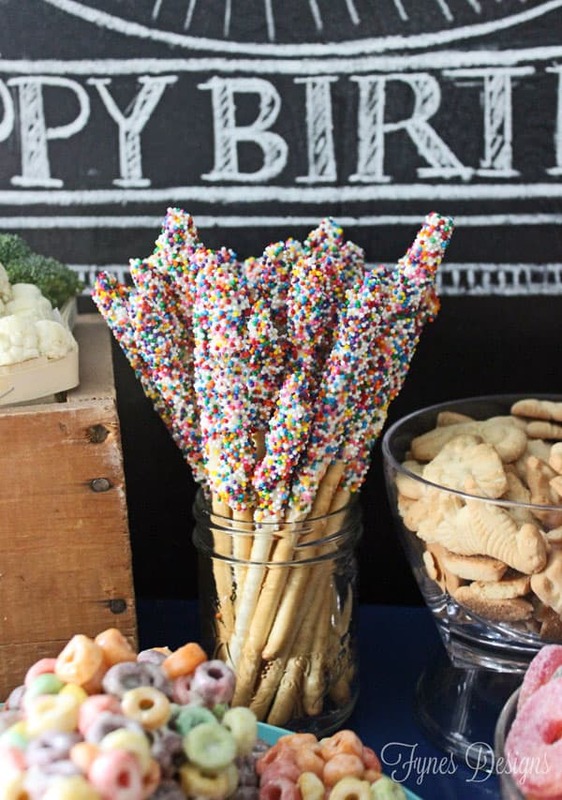 What are the ‘sticks’ for the sprinkle sticks? 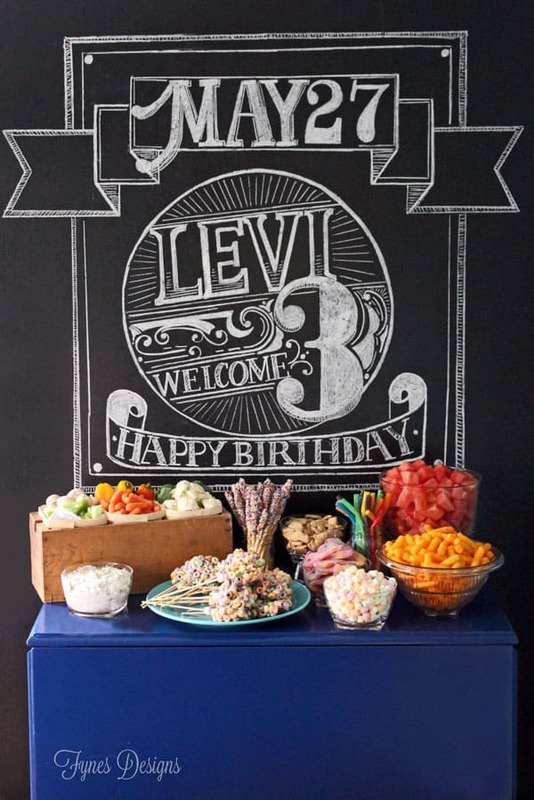 That chalkboard is amazingly gorgeous! I’m inspired 🙂 The treats also look delicious, too! How fun!! 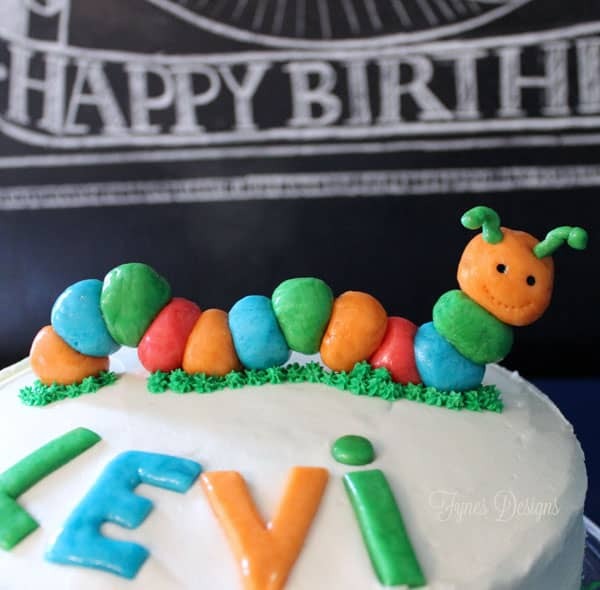 That’s a great way to make the caterpillar…I wouldn’t have thought of laffy taffy’s, but it turned out great.